1. Fill four heatproof glasses with hot water and set aside. 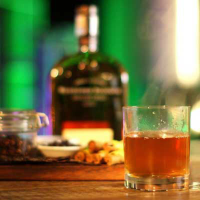 Pour 250ml water into a small saucepan and add all of the remaining ingredients, except the bourbon. Bring to a gentle simmer then leave to steep for 5 minutes. Strain through a fine sieve into a jug. 2. Drain the glasses and divide the bourbon between them. Top up with the spiced water mixture, add a cinnamon stick and serve.